Welcome to the 90 Day Weight Loss Giveaway! This is a fun giveaway, put on by several bloggers - Here you'll have a chance to win a 90 day supply of Diet Drops. The perfect way to start getting those pounds off for summer, right?! That's what I'm working on. I'd love to have a chance to try these, myself. Good luck everyone, and have fun entering! "Hosted by Stay a Stay at Home Mom with co-host Capri's Coupons. 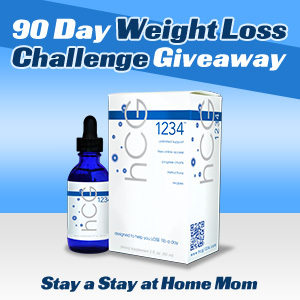 One lucky winner will receive a 90 day supply of Creative Bioscience hCG 1234 Premier Diet Drops. What is an hCG diet, you may be wondering? Well, hCG stands for Human Chorionic Gonadotropin, which is a hormone found in all people. It might sound familiar to moms; when you're pregnant you have a lot of it, and it helps to control (and redirect) your metabolism. An hCG diet involves hCG supplements in either injection (ouch!) or drops you administer under your tongue (yay!) combined with a low calorie diet, in order to lose as much as 1 to 3 pounds per day! Rayven from Stay a Stay at Home Mom gave it a try. You can read her experiences here and here. If you are looking to get more information on the diet, follow the Creative Bioscience blog and learn how this could be the kick start you need to get your 2013 weight loss goals off the ground"
One lucky winner will get a 90 day supply of diet drops. Giveaway runs from March 7 at 12:01am to March 28 at 11:59PM EST. Disclosure: The participating bloggers were not compensated for this post. We are not associated with any of the companies in this giveaway. No purchase is necessary to enter. Void where prohibited by law. The odds of winning are based on the number of entries received. This promotion is no way sponsored, endorsed or administered by, or associated with, Facebook, and is compliant with Facebook TOS. To qualify to win, you must fill out the Rafflecopter entry. Must be aged 18+ to enter and win. See Rafflecopter for complete eligibility requirements. Rats and More received nothing, and is not responsible for prize or prize shipment. My favorite thing is the holidays. Why is this closed when it says it ends 3/28? Thank you. Honestly, Amanda, I never did a weight loss resolution this year...mine was about getting things in order. I am not probably healthy enough to lose weight right now but I have a daughter who desperately wants to lose about 50 lbs by next year when her sister gets married. Baby weight and stress weight. It is hard to lose , I can attest.